TCSZ 463491 is a Mark V RoadRailer, used by Triple Crown (a subsidiary of Conrail and Norfolk Southern) from the 1980s to 2015 as an alternative to conventional trailer-on-flatcar (TOFC) intermodal transportation. RoadRailer trailers were built stronger than normal trailers, and suspeneded between two "bogey" trucks rather than sitting on a railcar. The trailers actually formed the body of the train. 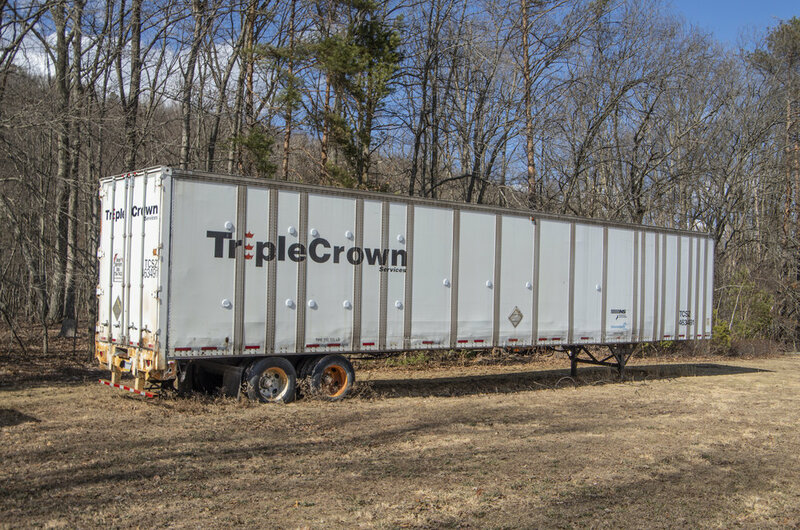 By using its own rail-friendly trailers, Triple Crown was able to deliver directly from warehouse to warehouse without having to involve a third-party truck carrier. However, changing times and aging equipment forced the RoadRailers into retirement in 2015, and the CRHS is the only organization to have preserved one. In May of 2017, TCSZ 463491 was moved to a storage location in Weatherly, PA on space that was graciously provided free-of-charge by our friends at Still Creek Automotive. The CRHS is currently looking for a location to display and interpret this important piece of railroad history - if you have any suggestions or contacts, please contact us!